The Hook: Heart-stopping talk box guitar “stuff” from Mick Mars takes the place of a traditional solo at the end of Nikki Sixx‘s song about about the time his heart actually stopped. Stats: The second single off Dr. Feelgood, following its Top 10 title track, “Kickstart…” peaked at number-27 on the Billboard Hot 100 and number-18 on the Hot Mainstream Rock Tracks chart. It was nominated for a Best Hard Rock Performance Grammy and its video for an MTV Video Music Award. 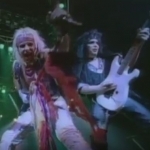 Motley Crue guitarist Mick Mars on recording “Kickstart My Heart.